…IF you know the right place to look! This is the story of some of my genealogical research done in two trips to the area of New England where I grew up and to Quebec and Nova Scotia, Canada where my older ancestors lived and died. The first chapter of this adventure took place in August of 1999. The narrative is based on a daily log that I kept on my laptop that I used to record all my genealogy research. My wife Lovina and I were on a visit to her sister in RI. Our plans for this trip would also include a day trip to attend a Pivin Family Reunion and then for me to spend a week traveling through Quebec and Nova Scotia to visit my cousins while Lovina continued her visit with her sister. The second chapter of the adventure is about continuing my search in RI, two years later, in 2001, based on some of the significant discoveries on the first trip. This is where I attempted to solve the mystery of the identity of my great-grandfather’s parents, whom I believe lived their whole lives in Quebec, Canada. I planned to pick up a rental car and drive with my wife and her sister, Jane, to Bristol, where we had all grown up. We could all have lunch with my wife’s father at the Lobster Pot. Things didn’t quite go according to plan, but it turned out to be my lucky day! 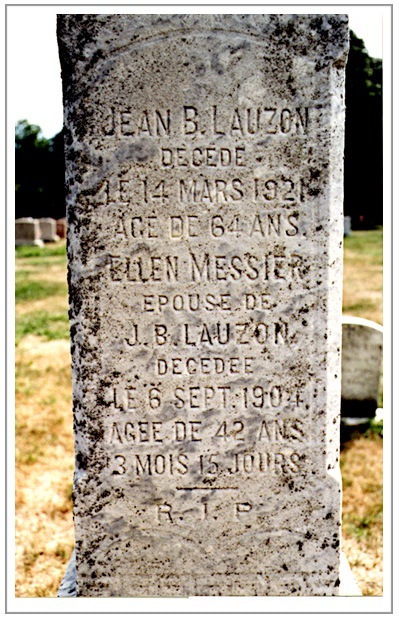 Cemetery monument of Jean-Baptiste Lauzon and his wife Ellen Messier in Warren, RI. I drove toward Bristol, thinking I would visit the rectory at St. Mary’s Church in Bristol to possibly find out more about my Pivin Grandparents. Along the way, I decided to go to the a cemetery in Warren to try and find my grandfather Peter Jeffrey’s grave which I seem to remember visiting with my parents in my childhood. I had a recollection of a tall white marble tombstone and believed it was the marker for my mother’s father. I searched all over the cemetery and could not locate it. I decided to go to St. Mary’s Rectory in Warren and ask if they had any records of the grave locations. They had none for any Jeffrey. Then the clerk suggested that I check the other two cemeteries which were next to the one I was looking at. The cemetery of the French Church, St. Jean Baptiste, was where I checked next. South Side of Lauzon monument with their son-in-law Joseph Pivin and his wife, their daughter, Mary Lauzon and grandson Oscar Pivin and his wife, Ida. I didn’t know if they are related to my Pivin grandmother for sure, but then I moved around the south side of the monument and my jaw dropped. 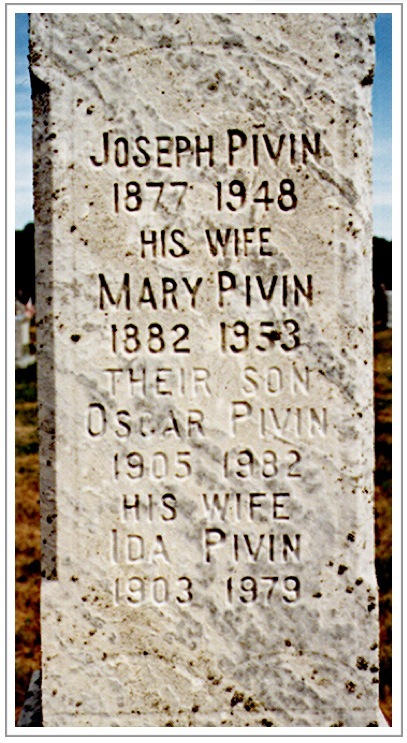 There were the names of my grandparents, Joseph Pivin and Mary (Lauzon) Pivin with their son Oscar and his wife Ida! Here were my grandparents and aunt and uncle on one side with what must be my great grandparents on the front. I would have to confirm this, but it looked promising. We called my father-in-law to say we would be stopping to pick him up to go to lunch, but he said he didn’t want to go out to eat so we stopped at another restaurant (Quito’s) to get some clam cakes and a fish platter to-go for him. I decided to do some more research while they visited with him, so I went to the office of the Bristol Phoenix newspaper to look for the obituary of my grandmother whose gravestone I just found. I knew she had died 22nd of July, and the tombstone said 1953, I asked to see their archives for that month. On the front page of the July 24th issue was an article about a trial of a 21 year old man named John McKenna who was arraigned in the hit-and-run death of my grandmother. The article was continued on page 2, ironically right next to her obituary. I remember the funeral very well, it was held at her house on Hope Street, with the living room set up like a funeral parlor room. I remember the smell of all the gladiolus bouquets and how she looked like she was asleep with a rosary entwined in her hands. I was only 7 years old and this was my first experience that I recall with the death of a family member. I read through the obituary and found the confirmation that J. B. Lauzon was her father and another precious fact: She was born in St. David, Quebec. This is a small town halfway between St. Germain de Grantham and Sorel, which were homes of my ancestral Pivins. Now I have a thread to follow with this line into the excellent records of the Quebec parishes. Her mother was listed as Helen Messier. Chances are good that I can follow both of these lines in the Blue Drouin Quebec Marriage records. I could not believe how this has turned out. Thinking I was looking for grandpa Jeffrey, it was an incorrect memory as far as the name on the tombstone, but I hit the jackpot on finding my father’s grandparents and a lead on where to look for more info on the line. One more generation back on these two people and I will have determined a full five generations back on my ancestry. Woke up to the sun shining in the window; I hope this lasts. I Headed for American-French Genealogy Society (AFGS) in Woonsocket, RI at 11:30. After an introduction by one of the volunteers I was underway on my research. The first thing I tried was to look for J. B. Lauzon in the Blue Drouin marriage index. No luck. I tried an alternate method with J. B., looking for his death record, but that was also fruitless. I did, however, find the death record of grandfather Peter Jeffrey which allowed me to fill in that blank. He was 44 when he died and that was in 1906, only two years after my mother was born. That must have been very tough for my grandmother. She never re-married and she and my mother went back and forth to Cape Breton, Nova Scotia over the next few years as my grandmother tried to make ends meet. Working on the Messier side of my grandmother’s parents had a much better results, as I was able to trace back through several generations and the marriages linked well. I also had luck in tracing the Ferron line of my great-grandmother, adding several marriages there. Our visit came to an end and we headed back to Arizona, disappointed that I did not find great-grandfather Jean-Baptiste’s parents. I just returned from a visit to RI, where my most recent ancestors lived and am delighted to report that after much searching I have found the identity of the parents of my great-grandfather, Jean-Baptiste Lauzon. I have been dead-ended for many years and this discovery came after many repeated efforts down many dead-end alleys. Those of you who have been searching in the US may benefit from what I have learned about church and civil record-keeping and the people who are in charge of the archives. This search was for the last couple to complete my 5-generation chart. I got very close to completing this when I found my great-grandfather’s tombstone on my last trip to RI two years ago. This was also when I drove through Quebec, New Brunswick, Cape Breton and Halifax, Nova Scotia, meeting many cousins and people I had met on the internet doing research. The tombstone was etched with his death date and I though it would be a simple job to find the record of his death. I found his wife’s record, who pre-deceased him, in the town of Bristol records, but there was nothing for him. Did he die somewhere else? Searching through the state archives yielded nothing. I was getting discouraged. I tried to contact the people at the church connected with the cemetery, but got no response. Now, two years later on this trip, I am determined to solve this mystery. I return to St. Jean’s church in Warren where I was told to go to another church in the town where the records were kept. No death record. There had to be something more than just a record that the burial took place there. The clerk at the rectory suggested that I look for a burial permit at the town hall. This would have been required to bury Jean-Baptiste Lauzon in Warren. I had never thought to look there in all my previous visits. I went to the town hall in Bristol and the clerk emerged from the vault with a huge tattered volume and again my excitement grew as her finger ran down the page and yes, there he was. My eyes quickly moved across the page to the right columns where his parents were listed: Jacques Lauzon and Hermine Brouillard. Oh boy, I was on a roll! Now to race across the state (only about 25 miles) to the AFGS library and their copy of the huge Blue Drouin marriage index. Two years ago I had searched the marriage indices and even a collection of Lauzon marriages but to no avail. My grandparents were not in the index and there was no way to connect to a particular Lauzon couple out of the many that were there. Could this be another dead end? Would Jacques Lauzon be in the index? The above re-creation of the Drouin Index entry for my grandfather’s parents shows what I found. The groom with his parents and the bride and her parents and the date and location of the marriage. From this entry, I could easily continue back through hundreds of years of family history since both of their parents’ marriages were listed as well. 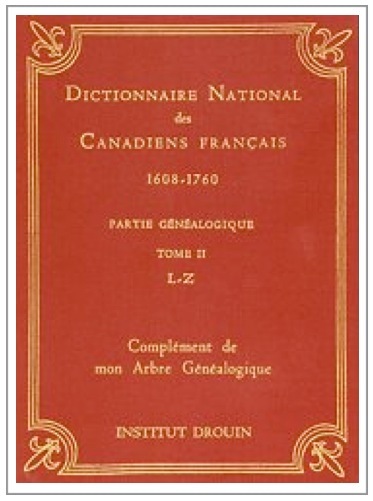 Once you get one marriage in this huge index, you are taken on a journey way back many generations to the late 1700s and can carry each of these back further in the Red Drouin index that covers back to the pioneer days of the early 1600s in Quebec when most of the French immigration took place. I could not contain my joy in the library atmosphere of the AFGS and let out a loud “YES!” when I found Jacques Lauzon and Hermine Brouillard. This has been my best day of researching, ever. I continued to work my way back in the index and added more than five generations to my father’s lineage as well as connecting to families before 1760 in the Red Drouin. I learned that church records and even civil records in the US are nothing like those in Canada for completeness. I learned that childhood recollections can be faulty and assumptions about where people lived can be wrong. One bit of advice to help with research: Talk to your elder family members before they join their ancestors. You will learn many things that are not found in any church or civil records and maybe even where to look for more information. This entry was posted in Uncategorized on September 17, 2013 by pivind. 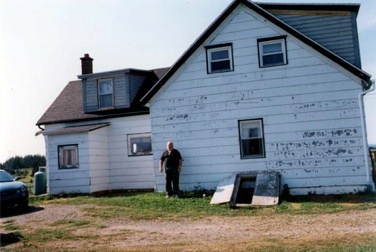 All I knew from when I was a kid and I first saw this picture, was that this was a picture of my mother next to a house on Isle Madame, Cape Breton, Nova Scotia, Canada. It was in or near the town of D’Escousse, where she was born. 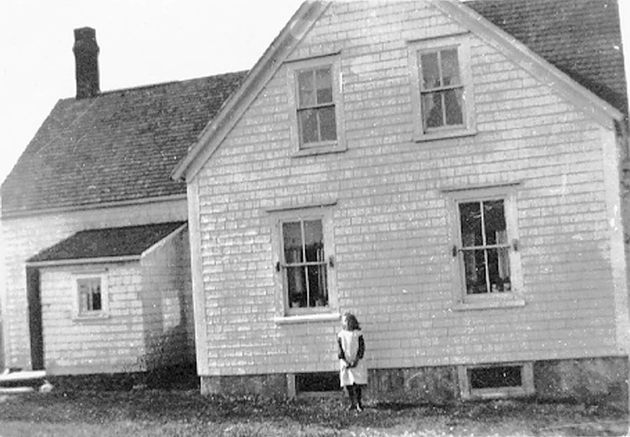 Taken around 1915, when she would have been 11 years old, I thought it might be a picture of the home of a member of the Kavanagh family, my grandmother’s maiden name. In early September 1999, I spent three days on the island and could not seem to locate it. 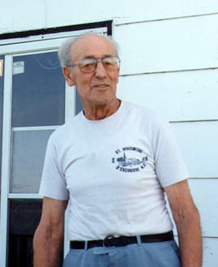 But on the last day, Vic Dawson, whom I first met on the internet and had been my guide around the island, took me to visit with Val Poirier, my 2nd cousin and closest relative still on the island. Val told us quite a few stories about the people on the island. I asked where the Kavanagh family lived and he said that it was just down the road, but that house had burned down in the 60s and possibly not by accident as there was a dispute over ownership. This was a disappointment and it looked like I was not going to see the old house. Then I showed him the picture of my mother in front of an old house and I wondered if he knew where it was. Val attested to all the changes that had taken place in the past 84 years since my mother stood outside: the windows and the mud room have been moved, the dormer and cellar doors added. This is the oldest, continuously occupied house on the island, built over 200 years ago and has remained in the Poirier family ever since! Below, I am standing near where my mother stood over 80 years earlier. 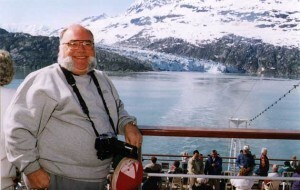 In April of 2009, my cousin, Val Poirier, pictured above, passed away. The home was kept in the Poirier family and was beautifully renovated as a summer rental along with another Poirier family home on the island by Wayne & Cecilia Poirier. 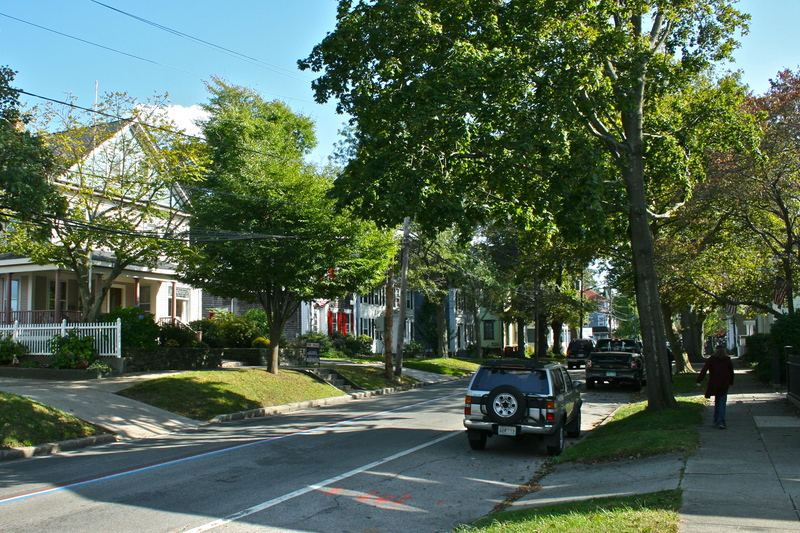 Photos of both homes be seen at this site, along with their history. This entry was posted in Uncategorized on May 10, 2013 by pivind. This article by me appeared in the monthly newsletter “Much Ado About Mensa” for July 2012. Sure, easy for me to say. But here is what I have learned over the past 10 years since I weighed over 300 pounds and how I permanently lost over 100 pounds. How you do it makes all the difference. It’s neither quick nor a diet. It’s about un-learning the bad eating habits that got you to that undesirable weight and how you educate yourself in good habits that result in permanent loss. First step in the process of adding years to your life is to discuss your current condition with your doctor and formulate a plan. Set a goal to achieve your ideal weight over an appropriate time scale. You will find that you will have to make some changes. Like I said, it’s bad habits that got you to where you are at. It may or may not involve changes to your current exercise routine, but the highest priority, the one with the most leverage, in my opinion, is to consume fewer calories. Here’s what my doctor suggested to me: “Try restricting your calories to less than 1800 per day to start out.” He didn’t tell me to exercise beyond what I did at work or my infrequent hiking/walking. 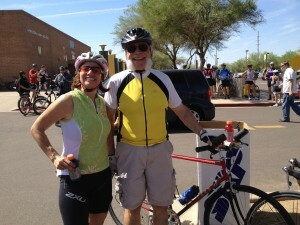 He gave me a “cheat sheet” of good nutritional meal plans with typical calorie counts. Seemed reasonable, but I then realized that it not only is it important to keep your diet balanced to stay healthy, you need to understand the nutritional value of what you eat along with the costly calorie “penalty” of continuing to eat the same quantity of the items you like. Even though I dropped the weight, I wasn’t close enough to being at a healthy weight. I had slacked off a bit in my calorie tracking and still didn’t exercise. However, I had learned a whole new set of “good” foods and what to avoid at all cost. I had drifted back up by 20 pounds over the course of a few years and then a wake-up call. A coronary artery blockage sent me to the emergency room. In spite of passing a treadmill stress test the week before and always having consistently low cholesterol I had to have five stents put into two blocked coronary arteries. I needed to continue my weight loss and complement this with some exercise once I was released to do so by the cardiologist. At this point, I retired from working and had a lot of free time so I started riding bike a few days a week around the neighborhood. First 2 miles, then 4, then 6, then 8 and finally 10 miles each time I went out. I also began doing it more often until I was out every day, making friends with the other “regulars” running or riding in the neighborhood. So over the past 10 years I learned what I can eat habitually yet still stay under 1600 calories average. I can still have pizza, chocolates, burgers and the like, but I just have to stay in budget. Speaking of budget, I now spend less on food! Holidays provide challenges, but keep the average around your budget and you will do fine. Today I use an app on my iPhone that tracks everything and even has a bar code scanner for packaged food UPC codes to lookup the information automatically. In summary, I have learned that diets can’t possibly work, since they are always temporary. Only a permanent change in habits can achieve permanent weight loss and a longer, healthier life. Photo at the top shows “before” on an Alaska Cruise in 1998 where I was approaching 300 pounds and below is “after” where I have lost over 100 pounds and completed a bike ride of 25 miles with daughter-in-law Lisa. This entry was posted in Uncategorized on May 8, 2013 by pivind. After many years of absence, I returned to the neighborhood where I spent the early years of my life. I was walking down the street I had walked so many times on the way to school or to the corner store for an ice cream. Although the homes and street were familiar, the picture seemed much different now. I brought my son to see my old neighborhood, to see where I grew up and he walked beside me now, gazing up at the trees that shaded the sidewalk as they had done for me then. It was mid-summer now and the leaves have reached maturity, especially the maples, first to sprout in the spring, with reddish-brown buds. Gazing across the street, a single tree stands deep green against the blue sky. A humid rush of air blows past me and tips the leaves back, exposing lighter green undersides. The trees had always provided a dense shade for much of the block in front of the house, but the branches seem now to be hanging lower than I remember. Some places I even have to duck to miss. Glancing down at my son I am struck by the realization that I was his height when I the memories were last imprinted on my mind. I remember how I often ran down this sidewalk and leapt into the air, stretching my arm out as far as I could to reach the leaves. I encourage my son to jump to get one of the low-hanging maple leaves. It’s time to pass on to my successor generation some key knowledge which is bound to prove useful later in life. He runs ahead and captures a prize leaf. Maples always were the best. Large smooth surface, tender to the touch, broad enough to hang well over both sides of a small fist. Perfect ammunition for a ‘popper’ and room enough for several re-loads. I don’t remember who it was taught me how to pop leaves, but it is something which I always did whenever leaves were within reach. Taking the hard won leaf from my son’s hand I begin to describe the process with the slow, deliberate motions of a magician. I place the leaf over my left hand, ample coverage even for my large fist. Holding my left hand out about a foot from my stomach I bring my flat open right hand down quickly on the loaded popper and POW! Oh, what a sweet sound! Later in the year, these v-shaped wings will dry out and drop from the tree on their own, spinning down slowly to earth and depositing themselves on the ground. With the rains of spring they will sprout into a very fast growing maple tree. But there is another use for these flying seeds. While they are still green and moist with sap, you just have to break the two halves apart and you have a Pinocchio nose kit for two. By splitting the end with the seed in half, and peeling out the seed, we both placed the sticky propellers on our noses, prepared to go up for ammunition again. “You need to form a circle with your fingers, keeping the fist slightly open, instead of a closing it ,” I said. Aided by this age-old secret, he again smacked the leaf and fist and squealed with delight when it popped loudly. The premise of one of my favorite PBS shows, “History Detectives” is that people bring artifacts to the team of investigators to get a question answered about the article. For example, “Was this an original Ronald McDonald costume?” The investigators followed leads and interviewed experts to answer the question and usually delight the owners of the artifacts. So I have recently tried to organize my large collection of old slides, prints and negatives by putting them into storage boxes, arranged chronologically as best I can. This required looking through each packet or envelope to guess when they were taken as not all of them were marked or had writing on the back. I have a stack of 14 boxes but only one box of the very old ones. As I was going through some of the negatives in the oldest box that had been saved by my mother in old shoeboxes, I found this one that triggered a renewal of a search for the identity of the photo on the wall above the fireplace. 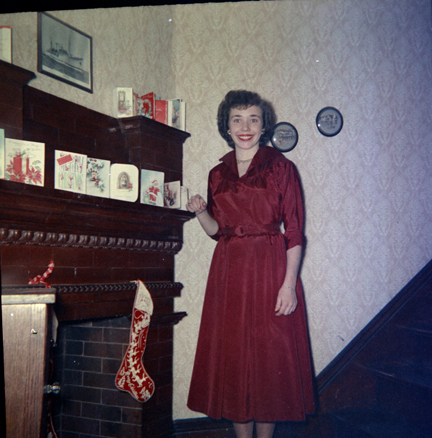 It was taken at Christmas in 1949. I would turn 4 in two weeks. My sister Dolores was 17 and in her senior year of high school. Every year, my mother would put all the Christmas cards on the fireplace. 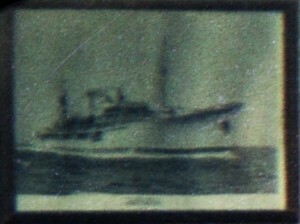 Above them was an old black and white photo of a Navy ship. 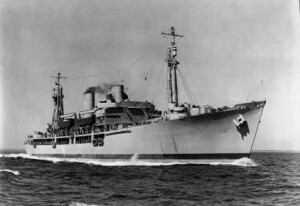 That ship, I was told, was one that my father had helped build during WW2 in the shipyard in Providence, RI. He had learned the plumbing trade from his father and took the job to help in the war effort as he was not drafted when the war started. This photo stayed up on the wall well into the 1950s. In the early 60s it was taken down and replaced with one of my paint-by-numbers paintings and I lost track of it. Several years ago, I tried looking through Naval history sites on the internet, but didn’t get very far in my search and I gave up. So now, after over 60 years, I tried again to search for the ship that my father helped build. I began to collect what little I knew about the ship’s construction to start a search. It was built during the war in the shipyard in Providence. I recalled that that dad called it the Kaiser shipyard. So now off to Google. ‘Kaiser shipyard Providence’ search term led to Kaiser Shipyards in Wikipedia. The shipyard in Providence was located at Fields Point, just south of downtown at the head of Narragansett Bay. The Fields Point Wikipedia entry led to the name Walsh-Kaiser Company, that had taken over operations of an earlier attempt to establish a shipyard under the Emergency Shipbuilding Program shortly after Pearl Harbor. Walsh-Kaiser Shipyard in Providence started with Liberty Ships, made famous for the extreme rate of launches, although no records were set at that location, Kaiser had built the SS Robert E. Peary at Richmond, CA yard #2, that launched in only 4 days, 15 hours, 29 minutes from the time her keel was laid. So looking through the Walsh-Kaiser page there was a list of all the ships they built in the period from 1943 through September of 1945: liberty ships, frigates and Artemis class attack cargo ships. Referring to the photo on the wall, that I clipped and adjusted below, I noted that it was not a liberty ship, or a frigate, based on a comparison to ships of that type, so it had to be one of the Artemis class cargo ships. But which one? So each of the ships listed by name had a link to more details and some photographs. I started down the list and noted that the first one pictured was first of the class, the Artemis and she had the same characteristic shape and I was sure I was on the right track. Then I clicked on the link to the USS Sirona AKA-43 and I couldn’t believe my eyes. Here was the same photograph that hung over the fireplace.